Grey dogwood is a commonly planted ornamental shrub. Multi-stemmed in form, it will generally reach a height and spread of 10-15 feet. As an urban ornamental, it can be highly pruned and maintained, meaning that it does not have a defined life expectancy (1). Grey dogwood develops large, white, showy panicles of flowers in late spring. In late summer/early autumn, the plant forms bright red racemes that bear many small white berries, adding aesthetic and wildlife value (2). The leaves are a lush green in color, with an elliptical to lanceolate shape. These leaves also boast a unique acruate veination. In the autumn, the foliage changes to a striking red shade (2). 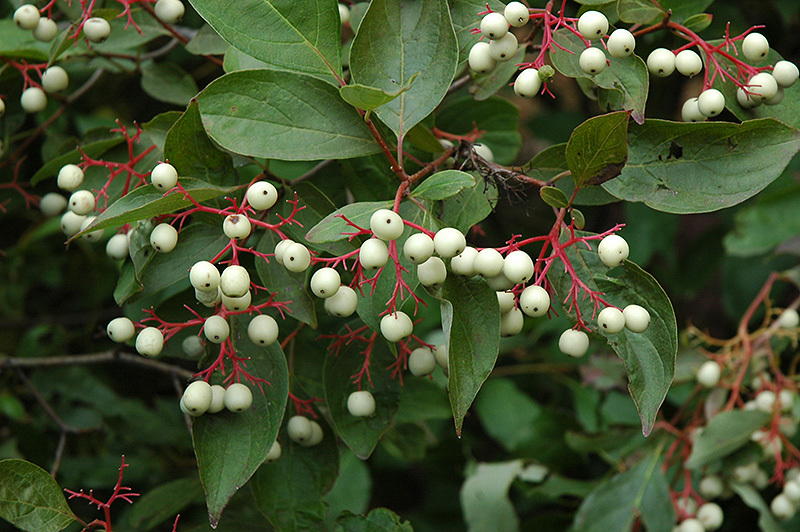 The berries of grey dogwood are used by a plethora of wildlife species, including white-tailed deer, squirrel, and many species of birds. The dense form of dogwood also provides ideal nesting and cover conditions (2). Dogwood is primarily used for ornamental purposes in landscapes. It is not commonly used to produce commercial products. Grey dogwood is mainly found in Eastern United States and Canada. This shrub is very site adaptable. It can tolerate many soil types, as well a wide spectrum of moisture regimes, ranging from poorly drained sites to droughty conditions. Grey dogwood will grow in Hardiness Zones 3-8, and requires full to partial sun (1,2). Grey dogwood can be bare root, container, or burlap planted in late fall or early spring, and should be amply watered until established (3). Top pruning for shape improvement and size reduction can be done shortly after blooming in late spring. Occasional renewal pruning to the ground in the early spring is appropriate when the plant becomes too large and woody (2,4). Leaf scorch or wilting may occur in extreme drought or heat conditions. The tree is also susceptible to a few cosmetic foliar diseases, such as powdery mildew, anthracnose, and botrytis blight of the flowers (5). A more serious disease that can occur is crown canker, which will usually kill the tree. When infected, the crown will slowly die back due to a girdling canker on the lower trunk. Risk can be minimized by preventing wounds from mowers or whippers (5). Dogwood is also one of the many species susceptible to Armillaria root rot, which will girdle the stem from the roots, often lethally. If present in the soil, this can only be prevented by planting other resistant trees (5). 1. Missouri Botanical Garden. "Plant Finder: Cornus racemosa". 2. Arbor Day Foundation. "Tree Guide: Gray Dogwood". 3. Tilley, Nikki. "Tips for Caring for Dogwood Trees". GardeningKnowHow.com. 4. Hawks Landscape. "Dogwood Others: Pruning, Winter Care, and Fertilizing". 5. Missouri Botanical Garden. 2/2012. "Flowering Dogwood Problems"